Phew, the title of this blog post is soooo long - and that is the condensed version!! I don't know about you but I have a case of Spring Fever - I want to clean my house, the yard, the garage, my classroom and just purge!! I also know that my students have a big old case of Spring Fever and we still have a lot to cover and accomplish! So I am linking up with some of my favorite bloggers to bring you tips on how to survive spring and make it to summer!! Each blog will have a fun tip for you to use in your classroom, maybe even a freebie. 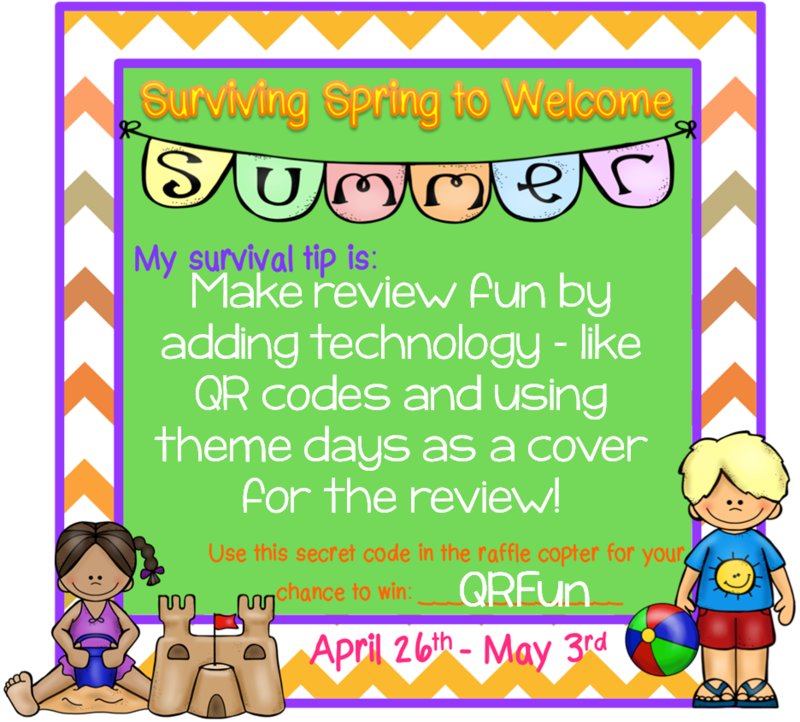 Each blog will also have a secret code for you to use to enter the Rafflecopter for a chance to win TPT Gift Certificates - which will definitely help you survive spring!! You can enter the Rafflecopter on each blog - woohoo! Like many of you I struggle to ensure that I have covered all of the curriculum (especially MATH) before our testing, I teach like a crazy person. Then testing is over and I have 3-4 weeks to fill in and not a lot left to cover. So what do you do to keep your students focussed, on task and engaged. I usually have some math that I want to dig deeper into, we spend some time with inquiry math but there are days where I really need the structure of a math class to keep us sane - so we review. But not just any review. I pull out as much technology based learning as I can - my kids love it and keep learning while they think they are playing. One of our favourite ways to use technology is with QR codes. These have the added bonus of allowing students to check their own - or their classmates work so I do not have to do any marking (Win-Win!). Also to keep my students engaged I use the ABC countdown (Jivey and the Collaboration Cuties can tell you more about that!). I love using theme days and the ABC countdown allows me to spice up my review by relating it to a theme. This year I am adding an Ice Cream Day and a Lemonade Day. Here is a sample of an activity I will be doing on Lemonade Day. I place the cards around the room and have the students move through the room answering the cards (with partners) and checking their work. Sorry this freebie has expired! This is a now a unit in my TPT store!!! 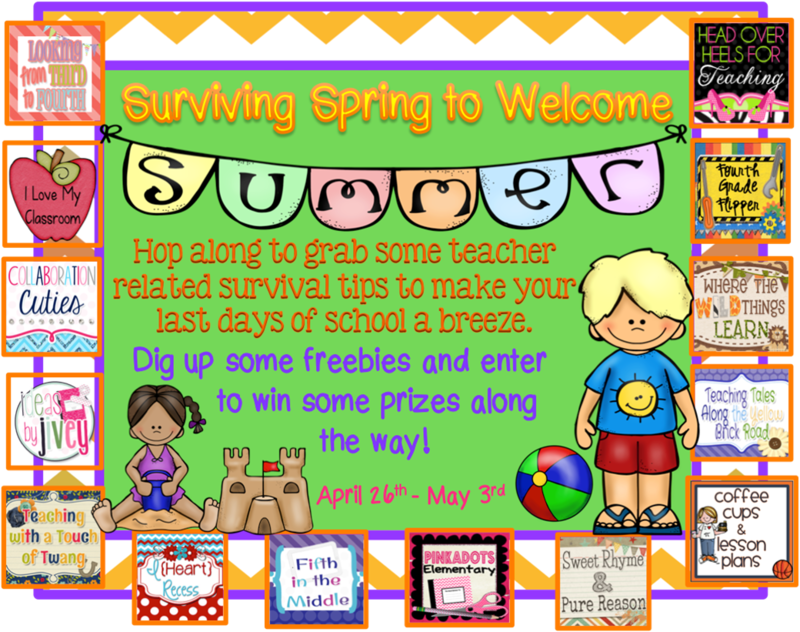 Since this is a great way to motivate students I am linking up with Joanne at Head Over Heels for Teaching and she is the next stop on the blog hop so don't delay head over there....well after you enter the Rafflecopter! We are the exact same before testing! We're mad women trying to make sure they know/remember everything! How cute is your lemonade QR product? I'm going to start the ABC Countdown too! 28 days left for us! Thanks for linking up BBB! Thank you for the freebie. What great questions! I've entered the contest, already a follower! Love your blog! Thanks again! Holy Cow! This is so perfect for me today! I am in the process of making individualized buckets for each of my students for the end of the year. Each student picked one topic that they feel they struggle with in math and they are working on it till the end of the year. I have many that chose multiplication! Thanks so much for this super cute product! I know my kiddos are going to LOVE them! My students love using their new iPads and QR Codes are awesome tools to engage students in learning. Thanks for the freebie!